Access to an approved 'next generation' text relay service for calls to and from people who are hearing- or speech-impaired, with special tariffs to compensate disabled customers for the additional time taken by these calls. Next generation text relay can be accessed from mainstream equipment such as PCs, tablets and smartphones as well as from textphones. To find out more about this service, visit www.ngts.org.uk or see Ofcom's consumer guide here. Access to emergency SMS (mobile only) for people who cannot make a voice call and who need to contact the emergency services. To use this service, text ‘register’ to 999 or 112. Registration only takes around a minute, so it is possible to register in an emergency, but advance registration is strongly recommended. For more information visit http://www.emergencysms.org.uk/. Free directory enquiries for consumers who are unable to use a printed directory because of a disability, with through-connection of calls. Priority fault repair (fixed line only) for customers who depend on the telephone because of ill-health or disability and have an urgent need for a repair. Third-party bill management, enabling a nominated friend or relative to act on behalf of someone who needs help to manage their affairs. Bills and contracts in formats such as large print and Braille on request. You need to register in advance for some of these services - please contact your communications provider for information about how to do this. The UK Regulators Network (UKRN) has also published advice on the extra help available to older, ill, or disabled people when using services such as gas, electricity, water, phones and public transport. 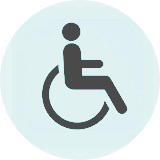 Communications providers are required to publicise the availability of services for disabled people. Ofcom has carried out research into how well communications providers are doing this. Ofcom discussed the findings of this research with the communications providers concerned and required them to produce detailed plans setting out how they will improve the situation. We also asked for copies of the training and reference materials that are provided to call handlers to inform them about these services. Subtitling, sign language on TV and audio description, known as television access services, help people with hearing or visual impairments to understand and enjoy television. Ofcom ensures that broadcasters provide minimum proportions of programmes with subtitling, sign language and audio description. Ofcom publishes information about the amounts of television access services that broadcasters are required to provide and what they actually deliver. Subtitling: currently 70 channels are required to provide some level of subtitling, with the BBC committed to subtitling 100% of its programming. Signed television programmes incorporate a signer translating dialogue and sound effects into sign language. Low audience channels may, as an alternative to transmitting their quota of sign interpreted programmes, pay an equivalent sum of money to the British Sign Language Broadcasting Trust which has been set up to commission programmes presented in sign language. Over 60 channels have signed up to this scheme and programmes can be watched on the BSL Zone on television and on the BSLBT website. Audio description comprises a separate audio track in which a narrator uses spaces in the original sound track to describe what is happening on-screen for the benefit of people with visual impairments. Like subtitling, it can be turned on or off. You can find listings of audio-described programmes here. An increasing number of set-top boxes and televisions receive audio description, and it can also be accessed on cable and satellite television. The RNID has a helpful factsheet listing the set-top boxes and integrated digital televisions that can receive audio description. All consumers benefit from equipment that is easy to use, but for disabled consumers this is a particularly important issue. Ofcom has a duty under the Communications Act to promote the development and availability of easy-to-use consumer equipment. However, Ofcom has limited regulatory powers in relation to such equipment. Instead, we work with others to promote usability. There is more information about our work in this area here. There are also some useful online resources to help disabled people choose equipment that will be suitable for them. Ricability has information about digital television, including indoor aerials, set top boxes, digital TV recorders and integrated digital televisions. The Mobile Accessibility database has detailed information about mobile handsets and their features.